Over the years I have owned and restored a wide variety of cars, among them a 1974 Triumph TR6 and a 1975 Cadillac Eldorado convertible. I have always been a Ford man at heart, and have long loved the looks of the 1961-1963 Bullet Birds. While living in Atlanta in 2011 I started seriously looking for a convertible Bullet Bird with a light colored paint scheme and a light interior. I was also pretty adamant that I didn’t want to take on another project car, but we all know about good intentions. I found my Bird (located in Massachusetts) on eBay and took a look at it in person. The color is Diamond Blue (light blue, almost robin’s egg color) and had been repainted but seemed original and complete. It came with the 1963-only two-tone seats (medium blue and light blue) and I was hooked. Yes, it blew smoke and yes, it needed a new interior—but I was in love! I figured I would just put in a new interior and then enjoy driving it around the beautiful Pacific Northwest (we moved to Federal Way in September 2012). Fast forward to January 2017. Over the past 5 years I have learned (painfully!) just how many deficiencies my baby had. Currently the engine is out for a rebuild and it is in the paint shop for the third time. But it is a labor of love and despite all the challenges I wouldn’t trade my car for the world. 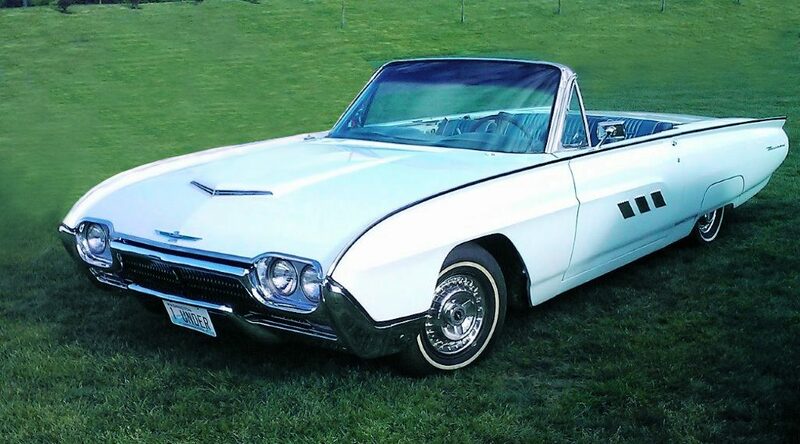 I have found a wonderful like-minded group of Thunderbird enthusiasts in the Rainier South Sound Vintage Thunderbird Club, and I encourage to you to join us in the enjoyment of all things Thunderbird! When I bought my Bird in 2011 I didn’t realize the paint scheme was not correct. My car had the engine bay and underside of the hood painted black. 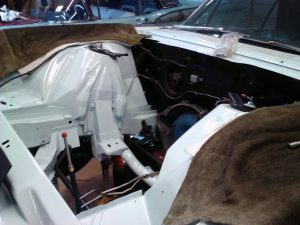 Later I learned Bullet Birds (1961-1963) are supposed to have the engine bay painted body color (with late 62’s & all 63’s having a black firewall). Since the engine needed to be rebuilt (another story all by itself) I decided to have the appropriate areas painted while the engine was out at the machine shop. The car came out of the paint shop on January 16; the photo shows how much better it looks with body color in the right spots. 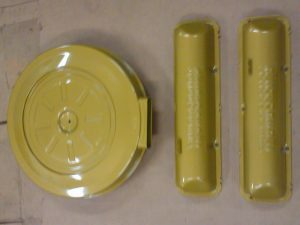 The second photo shows the repainted valve covers and air cleaner cover in the correct 1963-only Castillian Gold. Parts are slowing going back on the car, with the rebuilt steering gear box being the first. Not sure when the engine will be ready, but I am hoping to be able to drive the car to the March 2017 RSSVTC meeting (fingers crossed! ).